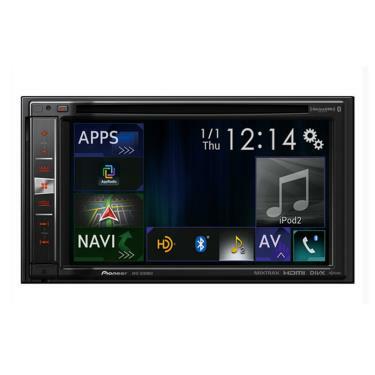 Double-DIN In-Dash Navigation 6.2" Touchscreen Navigation receiver with DVD/CD receiver/AM/FM tuner. Apple Carplay and Siri Eyes Free. The AVIC-6200NEX features Apple CarPlay, the smarter, safer and more fun way to use your iPhone® in the car. Apple CarPlay gives iPhone users an incredibly intuitive way to make calls, use Maps, listen to music, and access messages with just a word or a touch. Allows you to Connect your compatible iOS or Android™ smartphone with NEX for a truly connected experience, bringing many of your favorite apps right into the dashboard and letting you communicate using advanced high quality Bluetooth connectivity. In addition to playing numerous sources and file formats, Pioneer's AppRadio® Mode allows you to bring many of your favorite apps right into the dashboard. All NEX models feature built-in Bluetooth® that enables both hands-free calling and audio streaming. Including the latest Hands-Free Profile (HFP 1.6) with Wideband Speech capability, NEX provides more natural sound quality and details during calls. When streaming music, NEX even lets you browse and select the media stored on your smartphone using the AVRCP 1.4 profile. The AVIC-6200NEX offers a generous helping of A/V connections to maintain access to your media. Its HDMI input opens the receiver up to some of the newest A/V sources around — including Android phones — and the two rear USB inputs are perfect for your digital tunes, including FLAC lossless files and you can check out video from DVDs or other sources on the 6.2" display when you're parked. It different and looks nice..